Mining the Fagaras Range, Transylvanian Alps, Romania. Photo by mountain guide Iulian Cozma. Never before has the traveler had access to so much on-the-ground, up-to-the-minute beta. Never before has travel, by the miracle of technology, been so thoroughly rid of hassle, wasted time, wasted money—and, of course, dreaded uncertainty. But with the internet now in every traveler’s palm, are we losing something essential? Are we ruining travel? During a lull in last week’s storm we took it upon ourselves to hike up a mountain—and by hike up a mountain I mean put traction devices on our alpine touring skis and set out from our cars in a generally, then quite seriously, uphill direction for several hours, breaking trail through a thick, waist-deep accumulation of el-niño caliber snowdump, in exchange for a few minutes’ dreamlike turns on the way back down. We weren’t sure what to expect. We were the first-ever travelers to lay tracks in that newmade landscape. Pioneering in the Sherwins. Photo by Dan Patitucci. It was, as pro shooter Dan Patitucci had promised, hard labor. But we took turns doing the heavy lifting, with one or two proudly doing the bulk of it while the rest of us, toward the back of the line, chatted away about food and the state of publishing and such. We went up through the old-growth trees. We stayed clear the chutes on either side, so as to avoid dying a slow, horrible death by asphyxiation beneath thirty or forty feet of avalanche detritus. 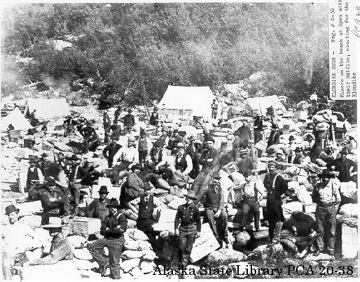 This was during the Klondike Rush, just before the turn of the last century. When fresh food was worth more than gold dust, and news, like hard supplies, traveled not on the ether but overland, passed from person to person, from mortal to mortal. It was tough going. Being the first in over the ice that season, it fell to this unfortunate fellow (and to his dogs and Indians, whom he drove onward at gunpoint) to hammer out a trail across half a thousand miles of snowy waste. His progress was slow. Behind him, in the brief twilight at either end of the days, he would often see a trickle of campfire smoke on the horizon. He wondered why whoever it was back there didn’t just overtake him. He didn’t get it. The golden point, of course, was the fortune he stood to make with those eggs. I paused to catch my breath, perhaps even took a turn in the lead for a few exhausting moments before once again ceding the glory to the harder men (and woman) among us. “Well, did he make it?” asked Patitucci. Oh yes, he made it, I said. And when he was not far out from his destination, he finally came to understand the slow progress of those who had for all those long, dark days been following in his track. Now that word had spread back down the Chilkoot that that trail had been broken, the rush was on. There remained for poor Rasmunsen one last tragic revelation upon arrival in Dawson City—to do with his eggs and the price they might fetch—but I’ll leave it to old Jack to tell you the rest. Starting for the Klondike. Alaska State Library. My concern here is more to do with the onslaught of other plunderers that poured in in his wake. At the top of the ridge the sky cleared briefly, giving us a view of the valley and the ranges beyond. Then some good orange light. Then the snow came in again. The ride down was not much of a ride at first, the snow being too deep to gain any momentum. But then the aspect fell away and we went with it, dropping through the trees, floating, soaring, the only sound that of steel edges cutting through a pile of delicate crystals—a pile soft as goosedown and deeper underfoot than a man is tall. And the occasional hoot-hoot of our fellows through the woods. 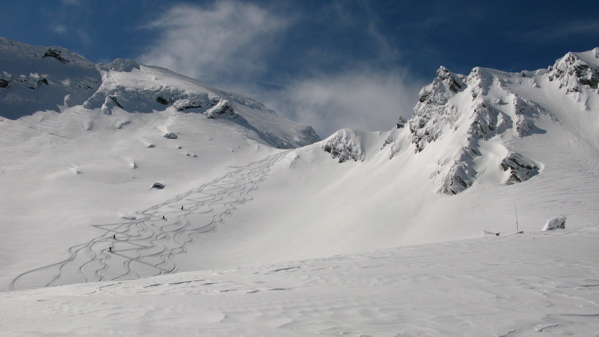 Even before we’d made it back to our cars we came upon another skier gliding fast and easy up our hard-won skintrack. 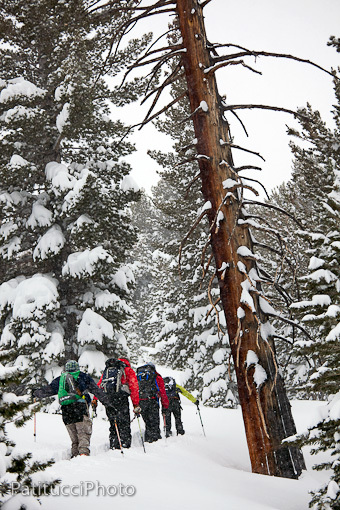 Later that evening, Patitucci posted an entry on his very popular blog and from there it spread to Facebook and Twitter, and by the next morning the whole mountainside was fairly overrun with powderseekers. Perhaps I exaggerate. But in any case the sense of solitude and discovery that is the golden egg, as it were, of adventure travel—which we had tasted for a day—was gone. Patitucci, whose livelihood is based on selling photographs, as mine is on selling stories, wondered if in this case he should have kept it to himself. It’s an age-old burden for the travel writer (older and heavier than today’s ethical quandaries about who should pay the bills): like the trailbreakers of yore, you beat your way to the next great “undiscovered” village, the last “lost” culture, the ultimate “secret” beach. You write about the wonder of the place. Maybe you give it away for free on Facebook. Maybe, if you’re scrappy, or lucky, you get two bucks a word for it. But in your wake the wonder, such as it was, is gone. The place will never be the same again. We justify it to ourselves in various ways: This is what we do. This is what people want. If we don’t do it someone else will (and maybe we can do it better, more responsibly). If pushed up against a wall, we take the anthropological tack, or that of the museum curator: we say, hey, we’re just trying to document this stuff before it goes away—we’re saving it (even as we track it up). Oh yeah, and we need the money. And what’s wrong with change anyway? Sicilians, surfers, fly fishermen and keepers of mythical, undiscovered hot springs have a code they call omertà, a code of silence. You don’t talk to the cops—even about your least favorite neighbors. And you don’t tell strangers about your favorite stash. Not long ago, a fellow contributor to The New York Times wrote a nice piece in that paper about one of my favorite places on the planet. The place—a hot springs, as it happens—was no big secret; it’d been written up before; it was once a favorite of Charles Manson’s; I’d even mentioned it (briefly) in my own guidebook. Besides, if you knew what you were looking for, everything you needed to know about how to get there was on the internet. Still, I was disappointed to see it splashed across the venerable pages of the Gray Lady. And though I’d done as much for places I cared less about, I couldn’t help but call the author on a breach of code. On some level, I guess he’s right. 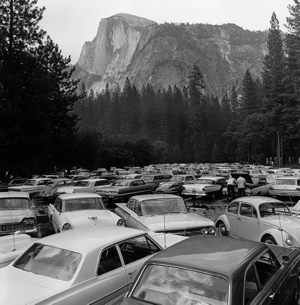 John Muir figured he was saving Yosemite by writing about it. And of course he did save it—from mining and logging and all manner of voracious industrial plunder. But how now do we save it from the 3.9 million of us who take our bootheels to the place every year—and from those who profit by selling us eggs and popcorn along the way? Hard to say. So should we really just stay home, as Winchester suggests? Of course not. But as we go out into the world, as we forge new paths to newmade places—or places new to us, anyway—it seems worth considering which part of our experiences we ought share with our fellows. And which, perhaps, we ought keep to ourselves.